Derry Rovers come from a comprehensive 4-0 win at home against Kilcock Celtic. Naas AFC come from a unlucky 3-2 loss away against Arlington AFC. Moone Celtic come from a unlucky 1-0 loss away against Rathangan AFC. Dunlavin United FC despatch Naas AFC. 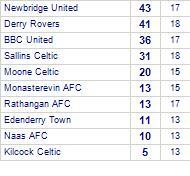 Dunlavin United FC has yet to be beaten in this competition, having won every game. Derry Rovers despatched by Naas AFC.